Search Results for "civil war confederate"
Fredericksburg Virginia Confederate dead memorial cemetery graves zoom out. Fredericksburg and Spotsylvania National Military Park and surrounding Civil War Confederate cemeteries. Memorial built to honor Union and Confederate. Spotsylvania Confederate Cemetery unknown soldier grave 4K. Fredericksburg and Spotsylvania National Military Park and surrounding Civil War Confederate cemeteries. Soldiers were buried, built to honor Union and Confederate soldiers. Fredericksburg Virginia Civil War Battlefield cemetery 4K. Fredericksburg and Spotsylvania National Military Park and surrounding Civil War Confederate cemeteries. Soldiers were buried and memorial build to honor Union and Confederate soldiers. Spotsylvania Confederate Cemetery headstones 4K. Fredericksburg and Spotsylvania National Military Park and surrounding Civil War Confederate cemeteries. Soldiers were buried and memorial build to honor Union and Confederate soldiers. Spotsylvania Confederate Cemetery headstones pan 4K. Fredericksburg and Spotsylvania National Military Park and surrounding Civil War Confederate cemeteries. Soldiers were buried and memorial build to honor Union and Confederate soldiers. Fredericksburg Virginia Confederate cemetery graves headstones simple 4K. Fredericksburg and Spotsylvania National Military Park and surrounding Civil War Confederate cemeteries. Soldiers were buried and memorial. Fredericksburg Virginia Battlefield campaign cemetery 4K. Fredericksburg and Spotsylvania National Military Park and surrounding Civil War Confederate cemeteries. Soldiers were buried and memorial build to honor Union and Confederate soldiers. Fredericksburg Virginia Confederate cemetery graves cross 4K. Fredericksburg and Spotsylvania National Military Park and surrounding Civil War Confederate cemeteries. Soldiers were buried and memorial built to honor soldiers. Fredericksburg Virginia Confederate cemetery headstones 4K. Fredericksburg and Spotsylvania National Military Park and surrounding Civil War Confederate cemeteries. Soldiers were buried and memorial build to honor soldiers. Fredericksburg Virginia Confederate cemetery brick wall grass 4K. Fredericksburg and Spotsylvania National Military Park and surrounding Civil War Confederate cemeteries. Soldiers were buried and memorial build to honor soldiers. Fredericksburg Virginia Confederate cemetery headstones graves 4K. Fredericksburg and Spotsylvania National Military Park and surrounding Civil War Confederate cemeteries. Soldiers were buried and memorial build to honor soldiers. Fredericksburg Virginia Confederate cemetery monument to dead 4K. Fredericksburg and Spotsylvania National Military Park and surrounding Civil War Confederate cemeteries. Soldiers were buried and memorial build to honor soldiers. The graves of a Civil War Confederate Officer and his wife are decorated with a small Confederate battle flag on Memorial Day. Fredericksburg Virginia Confederate cemetery graves monument 4K. Fredericksburg and Spotsylvania National Military Park and surrounding Civil War Confederate cemeteries. Soldiers were buried and memorial. Fredericksburg Virginia Battlefield memorial to hero 4K. Fredericksburg and Spotsylvania National Military Park and surrounding Civil War Confederate cemeteries. Soldiers were buried and memorial build to honor Union and Confederate soldiers. Fredericksburg Virginia Battlefield memorial to Pennsylvania 4K. Fredericksburg and Spotsylvania National Military Park and surrounding Civil War Confederate cemeteries. Soldiers were buried and memorial build to honor soldiers. Fredericksburg Virginia Battlefield cemetery unknown soldiers 4K. Fredericksburg and Spotsylvania National Military Park and surrounding Civil War Confederate cemeteries. Soldiers were buried and memorial build to honor soldiers. Fredericksburg Virginia Battlefield cemetery cannon memorial 4K. Fredericksburg and Spotsylvania National Military Park and surrounding Civil War Confederate cemeteries. Soldiers were buried and memorial build to honor soldiers. Fredericksburg Virginia Battlefield memorial statue Pennsylvania. Fredericksburg and Spotsylvania National Military Park and surrounding Civil War Confederate cemeteries. Soldiers were buried and memorial build to honor soldiers. 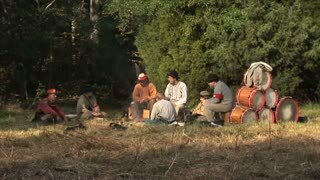 MOORPARK, CA - NOV 13: Confederate Civil War reenactors in "The Blue & The Gray" event on Nov 13, 2011 in Moorpark, CA. Its the largest Civil War reenactment in the West. Chancellorsville driving POV Civil War road fast 4K. The Battle of Chancellorsville was a major battle of the American Civil War, fought from April 30 to May 6, 1863. The campaign pitted Union Army of the Potomac against Confederates. THOUSAND OAKS, NOV 8: Union and Confederate soldiers participate in the 15th annual Blue & Grey Civil War Reenactment on Nov. 8, 2015 in Thousand Oaks, CA. The Moorpark Rotary Club organizes the event, the largest West of the Mississippi. THOUSAND OAKS, NOV 8: Union and Confederate soldiers participate in the 15th annual Blue & Grey Civil War Reenactment on Nov. 8, 2015 in Thousand Oaks, CA.